DREVO is a new company for us to work with here on Legit Reviews, but it was formed by a group of gamers in Beijing, China back in 2015 and has released some pretty good hardware and solid prices. DREVO has been targeting the PC gaming market with their products and have released a number of Solid-State Drives (SSDs), keyboards, and accessories like PBT Keycaps. We’ve seen many companies come and go over the 15+ years that Legit Reviews has been around, but it seems like DREVO has the momentum going in the right direction. 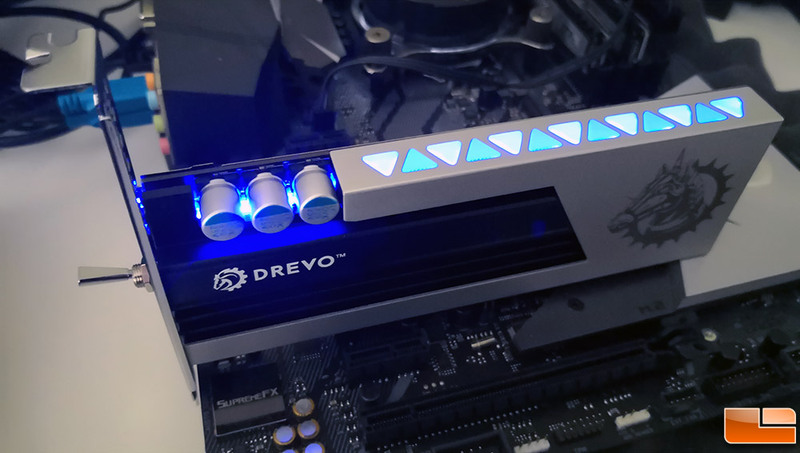 We got a chance to review their flagship SSD, the DREVO ARES 256GB PCIe NVMe SSD, and couldn’t pass it up the chance to take it for a test drive. 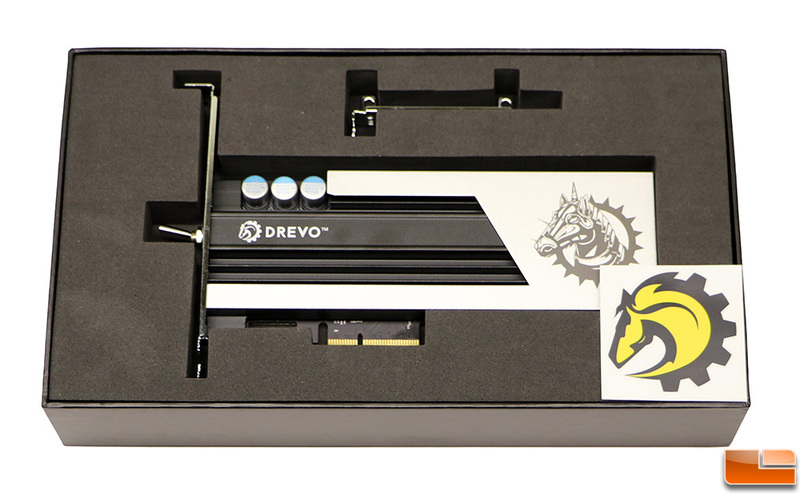 The DREVO ARES is only available in 256GB and is a Half-Height, Half-Length (HHHL) PCIe 3.0 x4 SSD featuring NVMe 1.2. The Drevo ARES features sequential read speeds of up to 1400 MB/s and sequential write speeds of up to 600 MB/s. It also has 4K Random Read IOPS of 100,000 and 4K Random Write IOPS of 150,000. These are not bad performance numbers for a drive using an SMI SM2260 controller and Micron 256Gbit 3D MLC NAND Flash. 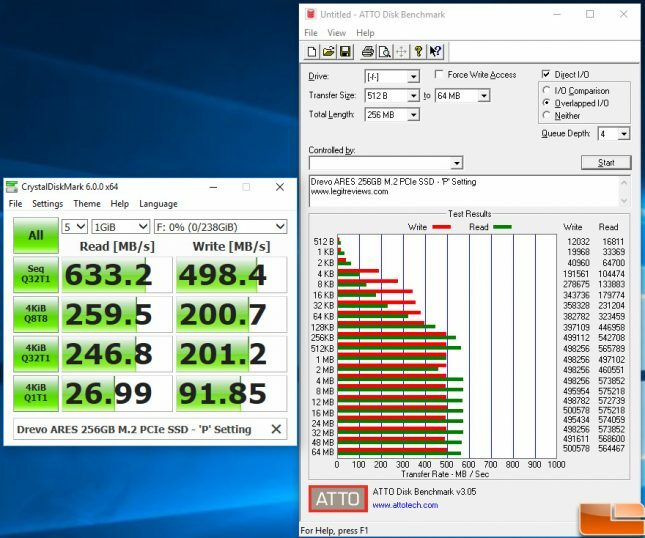 DREVO must feel pretty good about the combination as they placed a healthy 350 TBW endurance rating on this drive and back it with a 3-year warranty. DREVO even provides a data migration utility that allows Windows users to migrate data at no extra cost if needed. When this drive first came out in the summer of 2017 it was priced at $189, but recently it has been available to purchase on Amazon in the $99 to $119 price range. 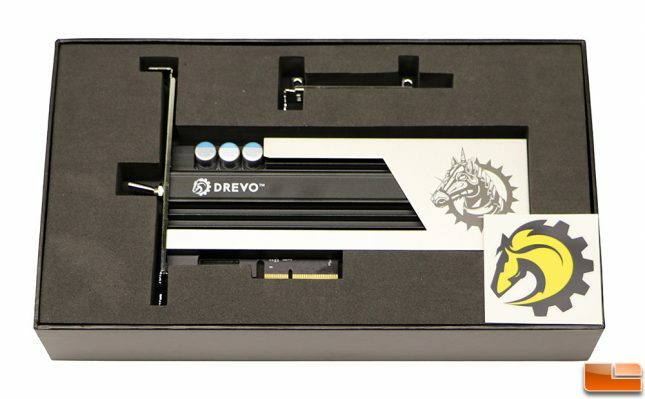 The packaging for the DREVO ARES was excellent and we love the unicorn logo that represents the brand. 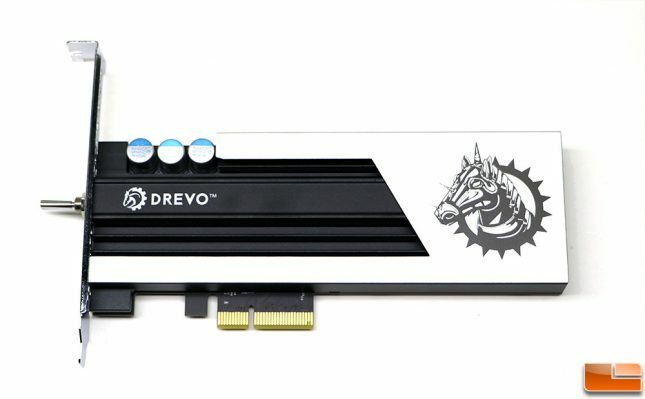 Nothing like a prancing war unicorn horse thingy on your hardware to store all your valuable data! Inside the box you get a sticker and half-height backplate if you need it. No instructions are included and DREVO does not have any utility software. DREVO has not released any firmware updates for this model, but it is supposedly user upgradeable if one is ever needed. You just use the native NVMe drivers in Windows and that is it. The DREVO ARES is 182mm x 121.04mm x 22.39mm in dimension and weighs in at 9.4 ounces. It’s been a long time that we’ve reviewed an SSD that tips the scales at over half a pound! The three position switch on the end of the card allows you to select what mode you’d like to run the drive on. DREVO fails to include documentation with the drive on what the three modes are. 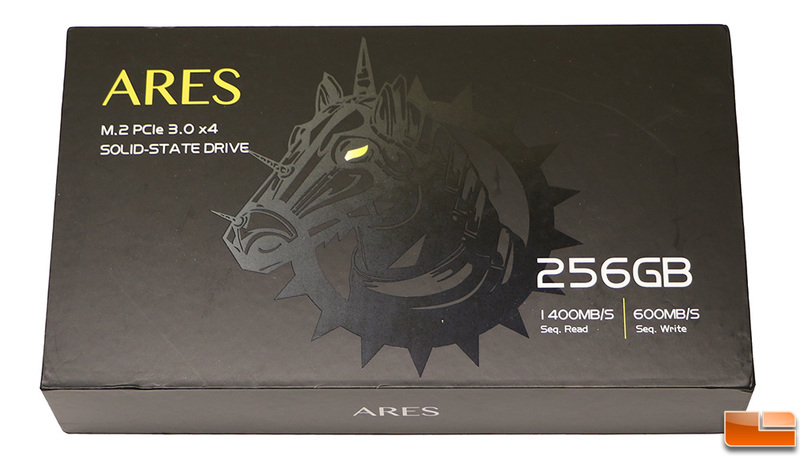 The switch is the most eye catching feature of the Ares drive and they don’t even cover it. We scoured the DREVO website and finally found the answer in the general FAQ section and not on the product page. Drevo notes that the ARES has three working modes (S, D, P) and listed what they were. Unfortunately, we discovered in our own testing that they were wrong, so this is what we found out. You want to leave it on S for the best performance (speed). The D (standard) and P (power saving) modes are useless and we aren’t sure why any desktop user would want to run this drive in power saving mode. The difference between settings is drastic to say the least. In P switch mode we were getting 575 MB/s sequential read and 501 MB/s sequential write at QD4 in ATTO Disk Benchmark and 633 MB/s sequential read and 498 MB/s sequential write at QD32 in CrystalDiskMark. This is no where near the drives rated speeds of 1400 MB/s read and 600 MB/s write. 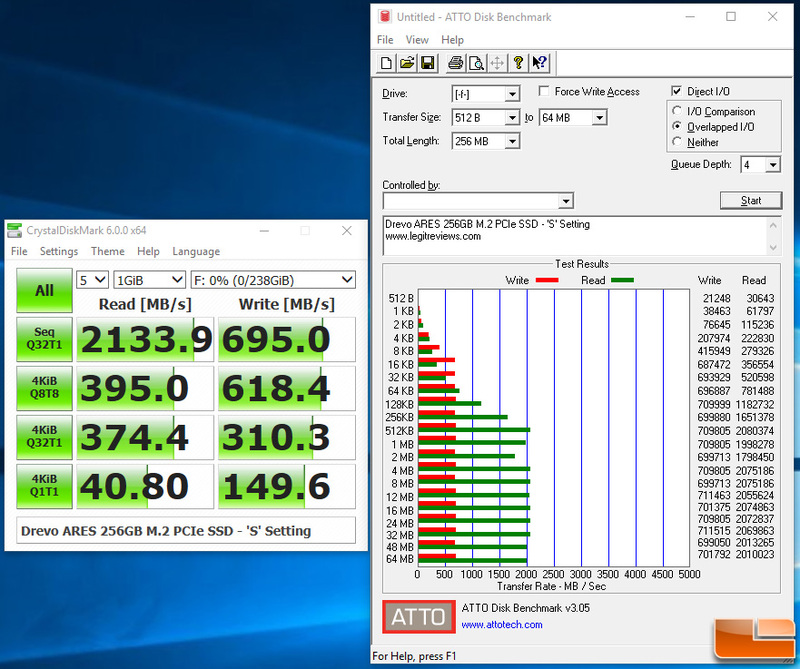 With the switch set to the ‘S’ position we found performance improved up to 2080 MB/s sequential read and 712 MB/s sequential write at QD4 in ATTO Disk Benchmark and 2134 MB/s sequential read and 695 MB/s sequential write at QD32 in CrystalDiskMark. 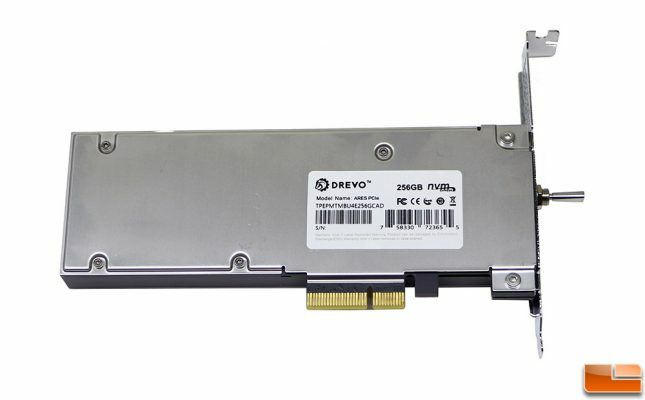 This blows away the drives rated speeds of 1400 MB/s read and 600 MB/s write! We did the testing for this review with the speed switch on the ARES drive set to the ‘S’ position and don’t know why anyone would run it in any other setting. 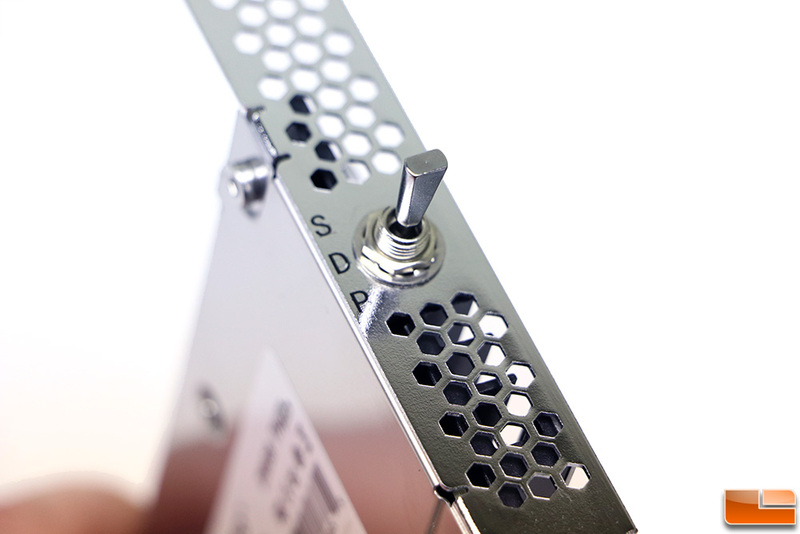 The metal backplate on the drive is a finger print magnet that is hard to keep clean, but other than that it holds the product label. This label contains the model name, serial number, UPC code and other information. The fine print says that the drives three year warranty is void if the label is removed or the case opened. The DREVO ARES looks great in a desktop PC and has nice blue LED lights across the top. DREVO set the LED lights to have a breathing effect and you can’t change it or turn it off. It’s rather unfortunate that you can’t control the LED lighting. We feel that DREVO missed a huge opportunity here to go with an RGB lighting design as that is all the rage in the PC enthusiast space these days. At a bare minimum they could have ditched the silly speed setting switch that 99.9% of users are going to leave on high-performance and allowed users to switch between three different colors or lighting modes. The good news is that the Drevo Ares looks better than most HHHL PCIe SSDs in our opinion. Let’s take a look at some benchmarks of this drive!